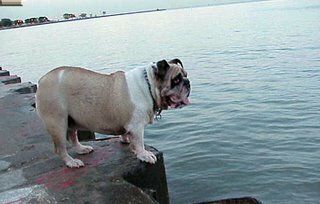 Dealer, the bulldog that liked to bark at the waves. Sunday afternoon in late September on Oak beach, just ten minutes walk from The Three Arts Club on N.Dearborn where I am staying. ( The student with whom I had exchanged had offered me his place to stay only the International Student Officer at the College had warned me that it was in the South Side and I would feel like I would be living in a movie what with all the sirens and shootings, so she had recommended the Three Arts instead). I am still reeling from the shock of discovering just how exciting a city Chicago is turning out to be. Every hour brings fresh surprises. Take this afternoon’s exotic pet. At first I think it’s a racoon attempting to scurry towards the water or some other long tailed animal accompanying two women. But nobody takes any notice. I go over to investigate. So do some children, not that there are many on this exclusive bit of the Gold Coast. .
“It’s an iguana,” replies the taller of the two women. And a very large specimen at that, all of three feet. No wonder I thought it was a crocodile. It’s not the only mistake I’ve made. These are not friends taking an afternoon stroll with an exotic pet. The one is a middle-aged, tall, blonde, wafer thin white American wearing an expensive silk designer sarong, and a pair of Gucci dark glasses topped with a golfing hat. Her companion is younger, Hispanic and plump, wearing a t-shirt, shorts and carrying a gold Saks Fifth Avenue shopping bag. Suddenly it clicks: rich woman with Hispanic maid. Meanwhile they release the iguana and it rushes into the water, swims around then sits staring at the sun, cause that’s what iguanas do. But this was not what the American woman had in mind. She wanted to stroll along the beach with her exotic accessory. Instead the animal lies staring at the sun because that’s what iguanas like doing best. It refuses to walk. She pulls it along pretending it’s walking alongside her like a dog, ignoring the trauma of the iguana with its little feet planted rigid, like anchors, in the sand. It’s an incongruous sight. Finally she scoops it up and tucks it under her arm like a toy dog. The maid, meanwhile, slips into the water. She swims for a few minutes too before taking a beach towel out of her gold Sak Fifth Avenue shopping bag. A few days later I mention this incident to an acquaintance, one of those casual friendships that strike up amongst people who have dogs. Somehow owning a dog makes social contact easy and people who would never normally speak to each other find themselves revealing all sorts of information about themselves to total strangers. Thus within a few days of arriving in Chicago I had met the owner of an English bulldog which every evening liked to stand on the shores of Lake Michigan and bark at the waves. “I saw this woman yesterday with an iguana,” I tell her.